Outside of the marketing context, the word “bounce” is actually kind of fun. It reminds us of childhood hours passed in an inflated bounce house, of a basketball game, or maybe even a game of jacks. But when it comes to your website’s analytics, it’s part of a metric that can be really confusing when you first stumble upon it: The bounce rate. A lot of questions pop into your head. Is a bounce rate close to 100% good, or bad? Is it at all like a bounced email? Is it a fluffy metric that I should ignore? And if I want to fix it, what should I do? Luckily, you’re not alone. Many marketers have asked those questions and might not have found a solid answer yet. We’re here to shed some light on the elusive bounce rate. 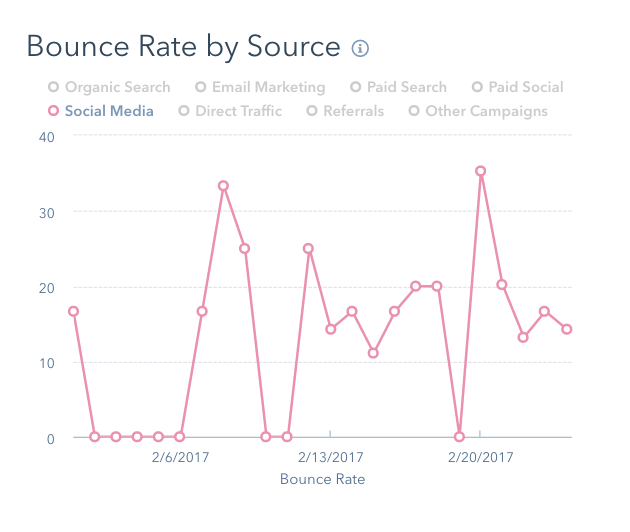 We’ve put together a quick overview of what constitutes a bounce rate — and what doesn’t — and help you find some ways to fix it. To answer what is perhaps the most important of these questions: No, your website bounce rate is not the same as your email bounce rate. Your website’s bounce rate is the percentage of people who land on a page on your website, then leave. They don’t click on anything else. They just get to one of your pages, hang out for a bit, then leave. Exit rates, on the other hand, are a little more complicated. They include the percentage of people who leave your website from a certain page — but, that’s not necessarily the only page they’ve visited on your website. The page from which they exited could be the last in a long sequence of page visits. That’s why the exit rate isn’t always as troubling as bounce rates. Let’s say you were comparing bounce rates and exit rates for a thank-you page. A high bounce rate on that page would be kind of alarming, because that means people are only viewing that page alone, then clicking away. Even worse, they didn’t fill out a form to get to it, which means you’re losing out on conversions. But a high exit rate, on the other hand, wouldn’t be cause for concern. It would mean that this page was the last in a chain of visits — people exiting from that page probably arrived from its preceding landing page, downloaded the offer on the thank-you page, and left to go make use of the content they just downloaded. Keep in mind that this scenario is hypothetical, and these takeaways can differ based on other page metrics — but it serves as a simple illustration of the difference between bounce and exit rates. Now you know what a bounce rate is. But what can you actually do about it? In general, high bounce rates might indicate that the page is irrelevant or confusing to site visitors. But don’t jump into drastic actions like deleting a page or undertaking a redesign right away. There are some important steps you need to take before you figure out which action to take. Remember: Bounce rates really only tell you that someone landed on a web page and left it without visiting any other page on your website. It doesn’t tell you how someone interacted with your page. 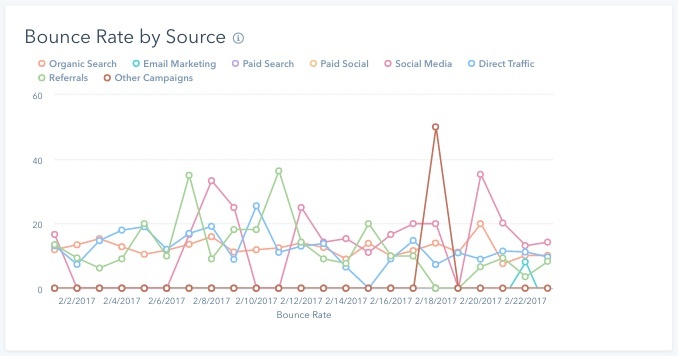 That’s why it’s important, says HubSpot’s Principal Product Marketing Manager Jeffrey Vocell, to take “practical steps” to examine other metrics and pieces of your web presence to see what might be behind the bounce rates. We’ve outlined these steps below. 1) Ensure your website is mobile-friendly. There are now more searches and traffic coming from mobile devices than desktops. That makes it crucial, says Vocell, “to not only provide a mobile-ready experience,” but to make sure that experience is engaging. How annoying is it when you arrive at a mobile site, only to have to zoom-in to read its content? Having a responsive site is no longer enough — engagement with the mobile version has to be user-friendly and interactive. Video is one particularly engaging type of content. It can often explain complex topics more concisely than text, which might be why 4X as many customers would rather watch a video about a product than read about it. But when it comes to mobile usage, long videos require a significant amount of data and might therefore slow the user experience — causing the visitor to bounce. For that reason, Vocell suggests eliminating these longer videos from your mobile site, or creating more concise versions that still address the most important points. This kind of improvement, however, isn’t limited to video. Take a holistic approach to evaluating your mobile experience, and consider how you’ll address contingencies like these. 2) Look at your bounce rate based on different sources. Let’s say your bounce rate is particularly high for visitors coming from social media — take a close look at the message you’re using to accompany the content you’re distributing. “Does it truly match what the content is about?” Vocell challenges marketers to ask. “Would a visitor clicking on that link in Twitter, or Facebook expect to see the headline, and initial image?” If the answer to either of those questions is “no,” your promotion strategy might need some work. When you’re distributing your website’s content, make sure the messaging actually matches the page to which you’re directing visitors. You have to clearly meet the expectations of the visitor — regardless of source. 3) Avoid other disruptions that might hurt the user experience. We’ve already discussed the importance of a good mobile user experience — but that actually goes for all platforms. Things like full-screen pop-ups, for example, are not only annoying, but given Google’s recent algorithm update, they can also result in search penalties. But the key thing to consider is the user. “You want visitors to be drawn into your page and stay for as long as needed to convert,” says Vocell, and while “some pop-ups are good,” — like well-crafted inbound messages that add context to a site — avoid any that significantly disrupt the user experience in a way that might cause visitors to leave. 4) Determine which keywords this page ranks for — and if your content sufficiently covers those topics. Remember how we cautioned against misleading visitors about your site’s content in social distribution? The same goes for keyword rankings. “Matching keyword intent to your content is important to ensure organic visitors get the content they expect,” explains Vocell. Let’s say someone is searching for “marketing automation software solutions” — it’s likely that this person is looking for software to help nurture leads into customers. But if someone is using the query, “What is marketing automation?”, she’s probably not at a stage where she’s looking to buy a product. Rather, this person is looking for content that’s more informative than anything else. So when you evaluate the keywords for which you’re page is ranking, make sure they’re aligned with the actual content. Once you’ve done that, try looking at a topic-cluster framework — the kind that groups your site’s pages into clusters according to subject — to help attract organic traffic to the right pages. When you’re investigating bounce rates, make sure you’re looking at the full picture. Take a look at the time people spend on your site, where they’re coming from, and what device they’re using — and if your content and experience are aligned with all of those factors. You might uncover patterns that show how you can fix the bounce rate problem. Think of bounce rates like your car’s “check engine” light. When it goes on, you know there might be a problem — but you need to check all of the car’s systems to accurately diagnose the issue. There’s no one-size-fits-all fix for bounce rates, but knowing what they are and how they can inform your marketing strategy can help ensure your website’s success. What have you done to address your bounce rates? Let us know in the comments. Editor’s Note: This post was originally published in April 2014 and has been updated for accuracy and comprehensiveness.